Hand-made for holding, this small Olivewood Cross is a unique reminder of God's grace on a daily basis. Want a gentle reminder of God's love? This Mini Holding Cross has been individually hand-crafted in the Holy Land using the finest olive wood. It has been uniquely designed to fit comfortably in the palm of the hand. It has no special power. It is simply a reminder of the price Jesus paid so that all may come to know the love of God. It is especially useful as an aid to meditation and silent prayer. 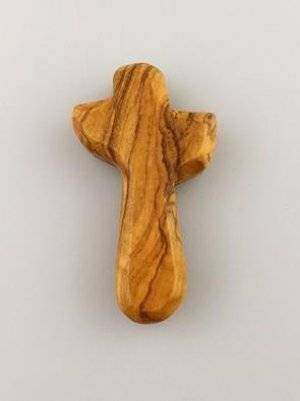 Mini Olivewood Holding Cross is published by Fair To Trade and is our 66th best seller. The ISBN for Mini Olivewood Holding Cross is 5060157852674. This tiny cross will make a lovely gift. A lovely small and tactile cross. Really small cross to hold right inside your hand. Beautifully made and great value! I bought this for a friend to comfort her on her mother' death. I love the feel of the smooth wood, so reassuring. However, I always make the point to whoever is receiving a cross from me that there is nothing magical about it, it's a reminder of what Jesus did on the cross and that He is with me always, whatever situation I'm in or going through. It's a lovely idea to have a small, pocket sized reminder of God's amazing love. Beautifully made and very tactile. I bought it for my grandson who had been having nightmares. It calms him down. Got a question? No problem! Just click here to ask us about Mini Olivewood Holding Cross. A:Our stock of the holding crosses is expected to arrive the end of this month/ beginning of the next, so won't be too long at all. Thank you for using the Q&A Forum.